Compatible with both PAL and NTSC consoles. - No emulation or software used. - hardware only converter. Add to Favourites. View Our Categories. Output: DC 9V 1A. 90cm-100cm lead leaving plenty of length to get from a wall socket to your Device. Input: AC 100-240V, 50-60Hz. PERFECT MATCH. (2) To better protect the circuit, extended service life, and make faster transmission. 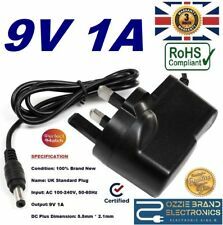 HIGH QUALITY DURABLE / RELIABLE FULLY TESTED PERFECT MATCH FREE P&P CHEAPEST ON EBAY WELL PACKAGED PLEASE NOTE THIS IS A REPLACEMENT OZZIE BRAND ELECTRONICS POWER SUPPLY ADAPTER WHICH IS COMPATIBLE WITH THE DEVICE MENTIONED ON THE TITLE AND LISTING. THIS IS NOT AN ACTUAL GENUINE PRODUCT FROM THE MANUFACTURER FOR THE DEVICE MENTIONED AND DOES NOT RESEMBLE ANY BRAND OR LOGO THIS IS ONLY A COMPATIBLE OZZIE BRAND ELECTRONICS POWER SUPPLY ADAPTER OUR 9V 1A POWER SUPPLY WILL WORK AS 9V 1A AND UNDER CURRENT SO WILL WORK FINE AS A 9V 0. Adapter cable DB-9 to NES 7-pin included. 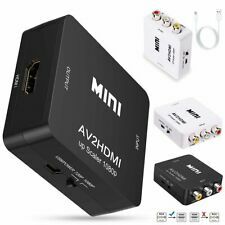 10.2 x 3.8 x 2.5 cm ; 136 g.
Simply plug standard composite AV cables (yellow, red, and white) into the input port of the converter, and then connect an HDMI cable from the converter to your TV. This converter works great with either 720p or 1080p TVs, and the output mode is easily selectable with a switch on the device. NINTENDO NES. This Power Adapter is Compatible With. Official 3-pin UK mains adapter compatible with Nintendo NES and SNES systems! Genuine Nintendo item! OFFICIAL NINTENDO NES / SNES UK MAINS ADAPTER. No external power source required - 50cm length (1.5ft). Add to Favourites. View Our Categories. Official 3-pin UK mains adapter compatible with Nintendo NES and SNES systems! Genuine Nintendo item!The cable has been tested to work perfectly! OFFICIAL NINTENDO NES / SNES UK MAINS ADAPTER. System Compatibility: NES/SNES/SFC Classic Edition Retro Rceiver Compatibility All 8Bitdo controllers & arcade sticks, PS3, PS4, Wii Mote, Wii U Pro, Connectivity Bluetooth 2.1 EDR, Class 2 Compatible with all 8Bitdo Controllers. Next Gen too. With the Retro Receiver, not only can you play your NES/SNES/SFC Classic Edition wirelessly with any 8Bitdo Bluetooth controller or arcade stick, but you can even use wireless next gen controllers, too. *Not compatible with SN30/SF30 2.4G controllers. Package Includes: 1 x Retro Receiver for NES/SNES/SFC Classic Edition 1 x USB cable. Applicable Products: for FC / NES. 1 Piece FC to NES Adapter. - Interface Type: 60 Pin, 72 Pin. - Pull ribbon for easily removal from front loaders. - Simple design, lightweight and convenient to use, easy to operate. Famicom to NES Converter Adapter 60 pin to 72 pin ONLY:19.99 EUR. Working with Famicom and Famiclone games, also working with Everdrive N8. 60pin --> 72pin game adapter converter allow you to play Famicom/Famiclone Games on NES console. This FC to NES adapter can be used on any NES Console except original Nintendo NES Console. Applicable products: For FC / NES. 1 x 60 to 72 Pin Adapter Converter. Simple design, convenient to use, easy to operate. 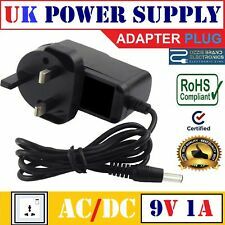 1 x UK Power Cord. 1 x AV-Port Cable. ITS IN AVERAGE USED CONDITION AND WORKS FINE. No extra driver required, plug and play. plug and play. Product size: 6.5 4.5 2cm, connecting line length 180cm. Colour: black. Thx for your understanding. No extra driver required, plug and play. plug and play. Product size: 6.5 4.5 2cm, connecting line length 180cm. Thx for your understanding. Material: ABS electronic components.